Niels Ryberg Finsen (1860-1904) is known as the inventor of Phototherapy, or artificial light therapy, and for this, he won the Nobel Prize in 1903. He began experimenting with both natural and artificial light from the early 1890s in order to treat lupus, tuberculosis of the skin. In 1896 he founded the Medical Light Institute in Copenhagen, Denmark, later known as the Finsen Institute. Finsen published his findings throughout the 1890s in Danish, and later these were gathered and translated into English as early as 1901, entitled Phototherapy; the French version appeared in 1903. 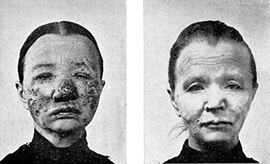 Gruesome and highly convincing before-and-after photographs of lupus patients accompany the publications. The photographs are employed for their documentary function; to record the progress of the treatment and of healing, evidence of the method of light therapy. Lupus patient, before and after photographs. Epithelioma of the forehead, illustration.